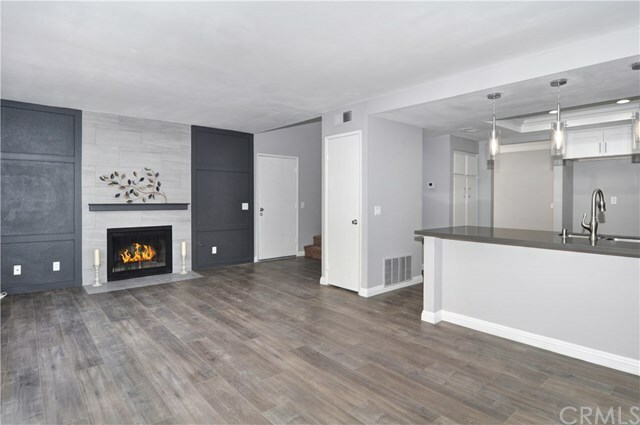 Meticulously remodeled, this turnkey home is the epitome of modern living. Newly renovated throughout, this home now boasts an open concept kitchen that is a chef's dream. Brand-new soft-close cabinets and all new appliances have been installed, and it features a beveled subway-tile backsplash and extended quarts countertop perfect for entertaining that opens to the spacious living and dining areas. The windows and cathedral-style ceilings allow for lots of natural light and the back yard patio has been re-mastered to feature an eye-catching, yet low maintenance, tiered garden. The Master Suite features his and hers closets, as well as an en-suite bath with dual vanity. Two additional bedrooms upstairs share a second fully-remodeled bathroom with a tub-shower combo. Downstairs bonus room can be used as a home office, additional family room, or could easily be converted to a downstairs, 4th bedroom. Freshly painted interior and exterior as well as new flooring throughout the entire home. Conveniently located next to 210 and adjoining freeways, shopping and dining centers. HOA covers trash, and home is walking distance to beautifully maintained community pool and park. Don't miss this great opportunity to live in the coveted community, surrounded by the beautiful foothills of the San Gabriel Mountains!